If you want a huge marathon PR in a year, and are willing to do what it takes, this site is for you. We have numerous success stories of runners that were already running sub-3:00 marathons that improved their PRs by 20-30 minutes with the help of our blog in a year or two through intelligent and consistent training. Two of them qualified for the US Olympic Trials. We have also helped numerous runners progress from dreaming to qualify for Boston to actually qualifying with room to spare. 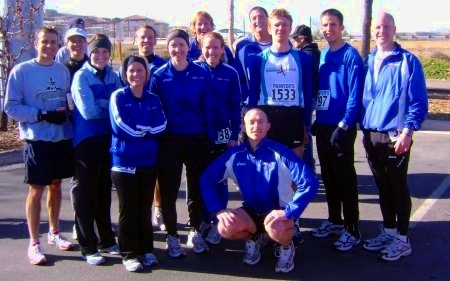 We have helped people progress from dreaming to finish or surviving a marathon to running it. The blog is free to join. We invite you to become a part of our group. This site contains training blogs of elite runners as well as some who are somewhat slower, and others who are barely starting to run. Where you currently are does not matter. We welcome you to join us. If you are a top runner we would like you to contribute your experience and share with us the joy of winning races and help the slower runners get faster. If you think of yourself as mid-pack, or just a beginner we hope that with the help of other runners on the Fast Running Blog you can improve your times significantly. Many runners suffer from a negative self-image, and refuse to have the word Fast anywhere near them. This will keep them from reaching their true potential if they do not find a way to conquer this illness. If you are one of them, contrary to what you may think, the Fast Running Blog is just for you. We will help you cure this disease. As you train consistently you will exceed your dream goals. But the first step begins with a decision to call yourself Fast, and setting up a training blog that we can see and comment on. It does not matter if you are a world-class marathoner, or if you weigh 300 pounds and cannot run at all, call yourself Fast and you will become faster than you are now. We welcome you at our site and are looking forward to watching you progress. You Create An Account, pick a template for what you want to log, and start logging your miles and writing comments about your workouts. If all you want is just a private log, stop here. If you want to share your workouts publicly, and receive comments from others, click on Blog Options, fill out your Blog Profile, optionally upload a picture, make sure to check the box to enable the Blog, and you get your own website similar to sasha.fastrunningblog.com. Your friends, colleages, training partners, coach, and others including myself come and give you encouragement and suggestions via comments. Record Keeping: Tracks your miles. Gives detailed reports. Enables you to see why you run well or not so well. Community support: Experienced runners you would not meet otherwise can help you troubleshoot and perfect your training and racing. Discipline and motivation: If you know your friends expect to see an entry, you will go out for a run on a difficult day when you might have skipped it otherwise. Memories: Years from now your children, their children and others will be able to know how you trained, what you tried, and what it took to succeed. They will know how you felt during your workouts, and how you dealt with different physical or mental challenges. You will be more than just an old man or woman to them. Hopefully they will learn something from your experience that will apply to more than running. Blog - you can optionally publish your workouts and allow others to make comments. You get your own website http://your-web-name.fastrunningblog.com. Your friends, teammates, coach, and other runners can follow your training and give you encouragement and suggestions. For an example, take a look at sasha.fastrunningblog.com. Easy calendar-style summary view of your training month. Data templates for runners of different levels. You can choose if you want to simply track your mileage, slow vs. fast miles, or be more advanced in your speed zone breakdown. Reporting by week, month, and year. Handy calculator to figure out your totals. Ever done 5x400, 10x200, 3x300, and finally 5x100, and then wondered how much fast mileage you have actually done? Export Course Analyzer Tool - upload a GPX file of your course or map it out on an interactive map, and it will give you splits for any desired target finish time or equivalent flat pace adjusting for the grade. Shoe Manager - keep track of your shoe mileage. Visual improvements in the web pages. Is there something special you would like to have? Use the Feedback Form to let me know. In 1997 I realized that paper method of keeping track of my workouts was inadequate for a number of reasons. So I wrote a one-user web-based training log for myself. A year later I re-wrote it with some improvements, added multi-user capability, and made it available to the public. However, the user interface was not that great. A year later I rewrote it again using it as an opportunity to learn PHP. The pages were not exceptionally pretty, but did the job for me and a number of other runners for the next 6 years. In the beginning of 2006, I decided to add more content to my website, and noticed that my running log could use some improvements. I am in the process of making them. Keep coming back to log your workouts and check for the new features.